Soft peppermint puffs by King Leo. Bite size peppermint candies that melt right in your mouth. These are made with 100% pure peppermint oil and are soft right out of the box. With a cool minty flavor that lasts a long time. 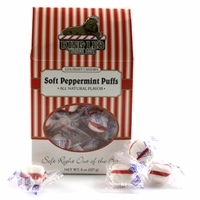 These are a perfect after dinner mint, breath freshener or just fun to eat. King Leo peppermint puffs are individually wrapped and comes in a 8 oz box.